A New Mac Tip Every Day: The browser in iTunes! This is a useful feature in iTunes that never really got much fanfare! The search function is useful, but if you are not exactly sure of the spelling of what you are looking for, you're out of luck. This is especially true when your library is rather large. The browser will let you scroll through a list of artist, album or genre. If you have five thousand songs in your library, you might only have between five hundred and seven hundred artists. Scrolling through the list of artists might be much quicker. It can also work if you have visitors and you know they like a certain kind of music. You cannot simply type the "Genre" in the Search box. The browser will let you select the genre you want and it will reduce the list of songs accordingly. The only thing I find disappointing about the browser is that it doesn't work with coverflow. The view mode must be set to list. You can get the browser by choosing "Show browser" from the View menu or by hitting Command-B. 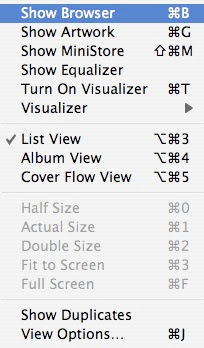 You can also click on the Eye in the bottom right of iTunes next to the Eject icon. Re: Mactipper. Please stop posting links to your sham of a blog. It's not really a tip blog, it's a list of potentially harmful hacks and over-complicated suggestions. It's also obvious that it's a fundraiser for your new macbook. Please don't suggest that there is any connection between this great blog and your sad version by posting here anymore. Do any of you out there know how to make the browser view the default when viewing your iPod contents? I love the browser, but i keep having to switch views each and every time i plug in my iPod! I was just about to comment asking MacTipper to stop advertising for their blog, but I see someone already did. It is really unnecessary and closely resembles spamming. Hey Bryan, click on the box next to "Remember view setting for each source" in the iTunes General Preferences. I don't understand why this hint to a well-known feature is called a 'tip' .. The iTunes browser shows columns Genre, Artist and Album. How can I add a 'Composer' column. Non-working Export menu in iPhoto '08! Copying and pasting adjustments in iPhoto! Address Book integration in Mail!